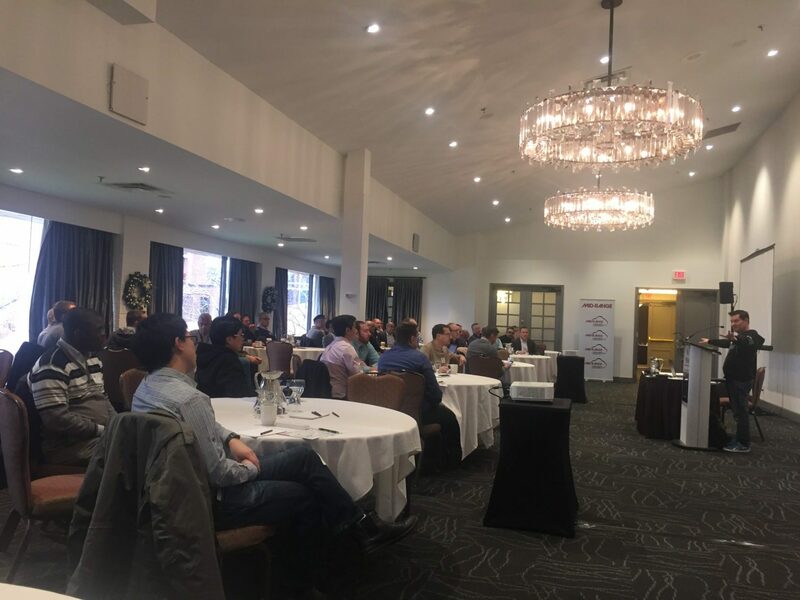 Earlier this week I held the Q4 meeting for the SouthWest Ontario Veeam User Group (SWOVUG) in Mississauga, and thus far the feedback has been great. This time around, we had Mid-Range and Hewlett-Packard Enterprise sponsor the event, as well as some great giveaways (iPad Minis and a speaker). We kicked things off with a great high-level overview from Garth Reid of where Hewlett-Packard Enterprise is heading. One point that was made clear is that they are striving to work with organizations to not only make sure they can find storage solutions that fit but that those data sets are properly protected. Proceeding right after Garth was a fellow Veeam Vanguard, Mike Preston. Mike works for a school board and was able to give a great overview of how they leverage their new HPE 3PAR along with Veeam integrations. The restore from snapshots and instant sandbox creation were a couple of features that were highlighted. I personally loved his visual representation of snapshots in which he changed a block of data so that it read slapshots. You’ve got to keep the content local, eh? Mike’s presentation was a great stepping stone into a true group discussion. We discussed quite a few topics, but the one that seemed to get a lot of engagement was related to ransomware. Many, if not the majority of organizations have seen it in some fashion, and hearing how other users defended against it was valuable. Some of the HPE folks were able to add insights as well, such as what they see in some of their large enterprise customers, and what can be done to mitigate it. I think the major takeaway from the talk was that nobody is safe, regardless of whether they are in a small Mom & Pop shop, or in a large multi-million dollar corporation. After lunch (once again, there was a lot of peer networking going on during lunch), we had David Sayavong from Veeam give us a run-through of what’s new in Veeam Backup & Recovery V9.5. There was interest in some of these new features, but we also ended up talking about the new Windows & Linux agents which are expected out soon. Some of the folks weren’t aware of these, or their use cases. One point that I brought up, and want to reiterate, is that these Agents can be installed on virtual machines as well. This leads to a situation where you can now backup cloud workloads (e.g. machines running in Azure or AWS), thus protecting not only your on-premises environment but also your cloud presence. Feel free to read my thoughts on Veeam’s ‘Availability Platform for the Hybrid Cloud’. This time around, I definitely saw a lot more familiar faces, which is great. I also received a lot of feedback during the event, and all of it was quite positive. The group discussion seemed to be of great value for several folks, and that was very pleasing to hear. When I started SWOVUG, I wanted it to be a user group in the truest sense: yes, we may have people presenting, but an open conversation should be encouraged. HPE did a wonderful job of embracing this by jumping in with very relevant insights, and not just trying to pitch a product. 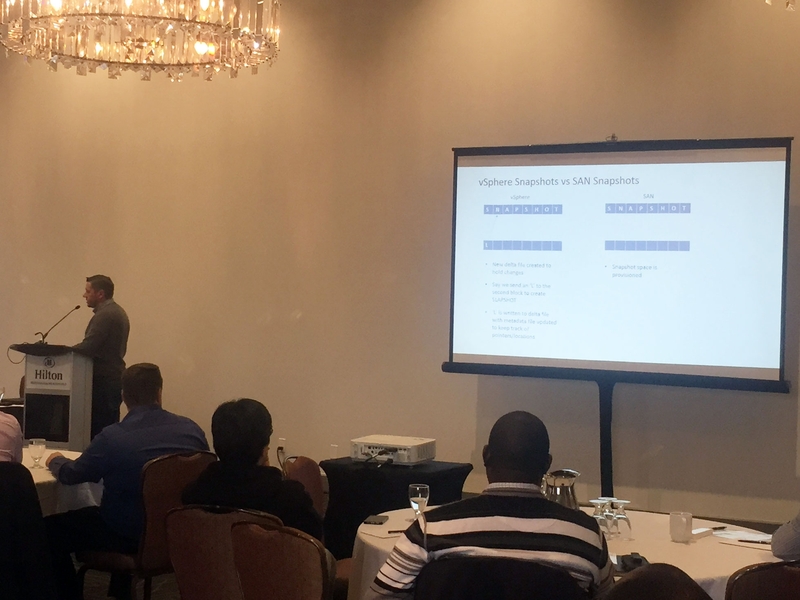 Mike Preston, who is also a Toronto VMUG leader, wrote up a recap of his experience attending his first Veeam User Group. He also touched on the topic of open discussion, and how it isn’t something you see all too often on the VMUG side. You can read his thoughts on his blog. Those evaluation forms are also very helpful for me, so thanks to all who filled them out. I’m happy to say that %100 of the participants who filled them out indicated that a) they found the meeting useful and b) they plan to attend future events. I don’t have anything firmed up yet for the next SWOVUG meeting, but it will likely be sometime in Q1 2017. I am going to try and coordinate with the local VMUGs to make sure the date doesn’t overlap with anything going on with them. In the meantime, if you have any thoughts or suggestions (whether it be on sponsors, locations, topics, etc. ), please feel free to reach out. As I mentioned during the meeting, this is a user group, and I need to know what users are thinking in order to make it useful and relevant.